soil-empowering material will amaze you with its miraculous qualities, making your garden both beautiful and sustainable. Improved soil tilth: Tilth refers to how suitable the soil is for growing plants. 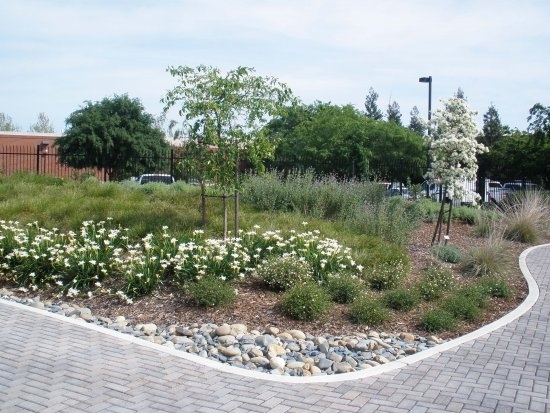 Mulch provides both food and protection from Delta winds, the hot valley sun, and frosty winters for micro- and macro- organisms living in the soil. This stabilized environment allows them to go about their business, contributing nutrient availability, aeration, and soil structure. Erosion control: With better soil structure comes better water absorption. Mulch also slows heavy rains so water has a chance to percolate into the soil; in summer, mulched soils are less likely to form a crust, allowing for better percolation when irrigating. Weed control: Mulch prevents annual weeds from germinating by blocking sunlight from hitting the soil surface. Water conservation: Mulch helps retain soil moisture by reducing evaporation, which usually translates into reduced irrigation needs. Healthy roots: Fine roots are highly susceptible to drought stress and high temperatures; mulch helps keep the soil cool and hydrated, enhancing plant establishment and overall vigor. Healthy plants are more resistant to pest damage, requiring fewer chemicals and less maintenance. The home gardener has many types of mulches to choose from; selecting the best for your situation depends on what and where it will be used, your budget, and availability. In beds where the ground will be worked every year (e.g. annual and vegetable beds), use short-lived materials such as straw or compost that can be incorporated into the soil if desired. Long-lasting materials such as bark nuggets are best for perennial beds where a slow release of food over time is desired. Soil organisms use up nitrogen as they decompose the bark, so it should only be used on the surface to avoid nutrient deficiencies (nitrogen eventually returns to the soil as organisms die). Synthetic mulches such as black plastic are good where warming the soil is desired (e.g. for vegetable beds) or to eradicate soil-born pathogens. However, it is not the best choice for perennial beds in the home garden. Plastic restricts air flow and water penetration, creates a mess as it breaks down, is not completely biodegradable, and weeds can grow through holes and tears. Drip irrigation must be used underneath, which can be difficult to inspect and maintain when covered with plastic sheets. Gravel has more aesthetic appeal than plastic and lasts a long time. Some plants, such as succulents, are much better off with gravel mulch. However, a huge disadvantage is it's high thermal mass, meaning it absorbs and radiates a lot of heat. This might be a bonus in some parts of the world, but not in a sweltering city like Stockton. Although some gravel is fine, avoid graveling your entire landscape to keep your air conditioning bills and the city's heat index down. Correctly applying mulch is just as important as knowing what kind to use. For ornamental perennial beds, a 3” – 4” layer of coarse bark or 2” of small bark is recommended. Keep mulch 6” away from trunks to prevent root rot. Mulching techniques for vegetables and annuals varies greatly, depending on the crop and type of mulch being used. Newspaper, straw and grass clippings are common and readily available; make sure the last two are weed-free to avoid a bed full of undesirables!